Walther 22 cal / 6mm Crimped Acorn Blanks -- 100 ct. $12.99. "Excellent service, fast shipping, everything that was expected! You should have no problems with this retailer! Will definitely use them again!!" Excellent service, fast shipping, everything that was expected! You should have no problems with this retailer! Will definitely use them again!! "They work great and are not overly loud." They work great and are not overly loud. I am training my 5 month old puppy for duck hunting. So I wanted to start out with a lighter load for the noise training and these acorn blanks do the trick. I will be moving up to the next size load next week. Super fast and easy. Will definitely use Gun Dog Supply again. "Good level to get started with." Working great in my standard 22 cal revolver. Good level to get started with. "They worked better than the other brands that I have used." They worked better than the other brands that I have used. They work great. Excellent quality at a great price. "Worked great for my late 1800s parlor cap gun." Worked great for my late 1800s parlor cap gun. Thanks. "The perfect amount of sound for starting hunting dogs." The perfect amount of sound for starting hunting dogs. I would recommend these for preventing gun-shyness to all new dogs/puppies! Buy 2 boxes at least! These are the best. Great quality. No misfires. Load enough. They are truly the best blanks I have ever used I am going to buy more. That's for sure. "These blanks are even louder than I expected, which better simulated real gun sounds." These blanks are even louder than I expected, which better simulated real gun sounds. Great for getting my dog comfortable around real gunfire. Great product. Very good quality for the price. "Great service and exactly what I needed." Great service and exactly what I needed. Only used a few. Seemed to work fine. Perfect blank to help with training. My favorite. Works great. Not a dud in the batch! Worked well only had 10 not fire from approximately 150 rounds. They are loud and are great for training young dogs. Works just like I expected. I bought a blank pistol in Germany in 1953 when I was in the army (paid $4.20 for it) ran out of blanks years ago finally found some. Thank you. It works in the older model training pistol. Works well, just right to start pups! Blanks fit and perform well. Great. Fit well and sound is loud. The 22 blanks aren't as loud as the 308 primers, but they are a lot more consistent. Works great. Best bang for the buck! Fast and simple to order. I will shop here again. "I have had nothing but satisfactory products from Gun Dog Supply." I have had nothing but satisfactory products from Gun Dog Supply. "They go bang. They work good"
"Product was just as described and shipping was fast." Product was just as described and shipping was fast. "Glad I can get them reasonably priced from Gun Dog Supply." I'm shooting blanks. These things are no longer available locally, Gander etc. Glad I can get them reasonably priced from Gun Dog Supply. "I am happy with the service and for a fair price." These are difficult to find for some reason. Glad I found you. I am happy with the service and for a fair price. "I appreciated your very prompt service." Thanks. I appreciated your very prompt service. 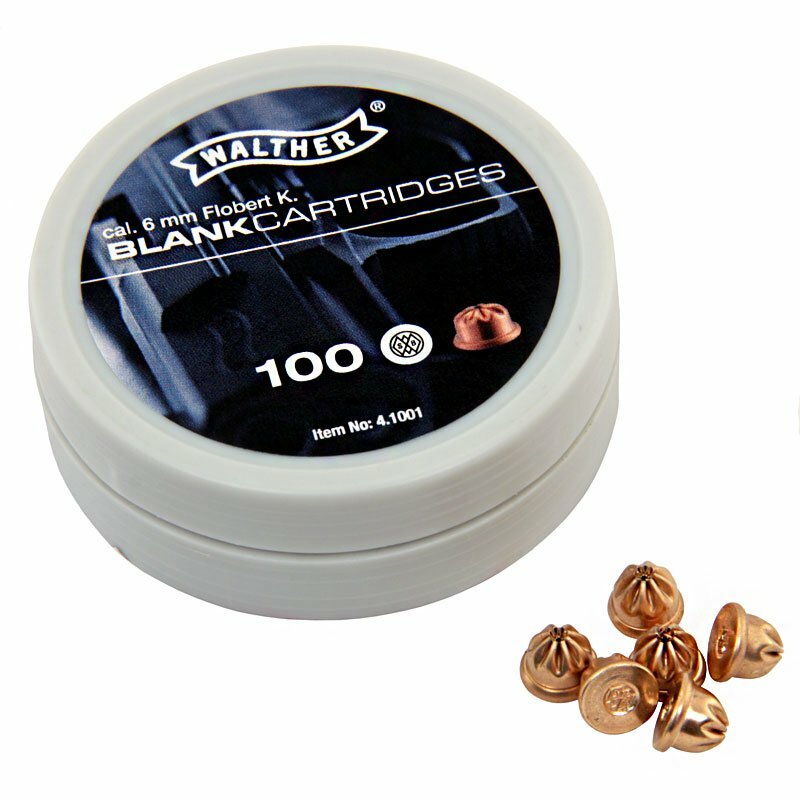 They will be used in an experimental project using the Walther blanks in a handloading exercise. If it works I will be back for more. Small but works fine. When training dogs, this is the size of load I like next to them. "Use to train horses not to spook when they hear loud shoot." Use to train horses not to spook when they hear loud shoot. "I have used them before, and they work great." I haven't been out training because of the holidays, but I have used them before, and they work great. "The service was impeccable, the price was right, and the product shipped right away and arrived right on time. " I use these in theatrical productions. They are very reliable and are loud enough for a small theater without blowing out anyone's hearing. These are always used in plugged barrel stage guns and are very safe. The service was impeccable, the price was right, and the product shipped right away and arrived right on time. Thanks. "This is the blank to use"
I purchased the 6mm blank pistol crimps that are awesome. Most everywhere I have looked the pricing was much more expensive. The advantage to these blanks is that they are much quieter and great for starting a pup or young dog on. I used to buy the larger blanks, which I could only find at our local sporting good store or a sporting store chain. This is the blank to use, period!!! "Happy with them. Great for training." Happy with them. Great for training. "These blanks were $10 less than anywhere else, and they work perfectly in my starter pistol." Super fast shipping. These blanks were $10 less than anywhere else, and they work perfectly in my starter pistol. "Great price and shipped very quickly." Thanks again. Great price and shipped very quickly. "The 22 acorn blanks were great." The 22 acorn blanks were great. Thank you. "Very good product that has black powder in it." "Performs well in my gun." Performs well in my gun. A little more gun powder. 5 stars. "Does what it's supposed to do. Slightly louder than a .22. Great for building up to 12g." Does what it's supposed to do. Slightly louder than a .22. Great for building up to 12g. I'm having a problem with the pistol. The shells won't fire. I'm trying to contact the people who sold me the pistol! Thanks!! "Nice and loud for the price." Nice and loud for the price. "I should have started with these blanks first." I got the 22 cal blanks very soon. I have one GSP that is afraid of guns. These blanks aren't too loud, and he is starting to come around. I should have started with these blanks first. "They met our needs perfectly, and the price was right." Hi guys. I don't own a dog. Love 'em, but I got four kids and can barely afford them. I bought the blanks for use in active shooter training. They met our needs perfectly, and the price was right. Thanks. "Works real good with a pup." Works real good with a pup. Trained my pup last year with them, and I'm training my new pup with them right now. "The price was the biggest PLUS on this purchase." Looked for a long time to find this item. The price was the biggest PLUS on this purchase. Shipping was fast and secure. Would do it again. Plenty loud. Works great. Ejects perfectly. Pour right out of blank pistol. This was the quietest blank offered but still surprised me how loud it was. Worked well though, my 4 month old lab does not even flinch now and is completely bused to it. Time to move up to a louder blank. I haven't gotten to use them a lot yet, but so far they are great. Perfect for my younger dog at closer ranges. These blanks perform well and are perfect for young bird dog gun training. "Good product, but seems as loud as the larger blanks." Good product, but seems as loud as the larger blanks. Harder to load, but less expensive. "It's yet to be determined whether or not it works long term." We used to have Shorthairs and used the gun to start puppies. We have lent it to other hunters to start their pups, and they have told me they would like the blanks to be louder. At the moment I am just using it to try and scare off deer that are eating my garden. It's yet to be determined whether or not it works long term. They work exactly the way they're suppose to and Gun Dog Supplies has a good selection to choose from. Good prices and I really like working with Gun Dog Supply. "Not very loud, but fine for a puppy." Not very loud, but fine for a puppy. No issues in the Viper blank pistol. "They work just like they're suppose too." They work just like they're suppose too. "Worked great in my starter pistol." Worked great in my starter pistol. These blanks work well in my blank gun. They perform as expected. I like the Acorn Blanks. Very good for initial gun dog training. Loud enough, but not too loud. They're black powder, so you get all that comes along with that. But a very good product. They often misfire. I use them in a blank revolver for training my dog, but one in 5 don't fire the first try. "They work just fine, but are not loud enough." They work just fine, but are not loud enough. I prefer the CCI Loud Short Blanks. "They do not fire with a consistent sound." They do not fire with a consistent sound. Most sound more like a thud than a pop. When looking at the spent cartridges, some do not really open, which is probably connected to the differences in sound. I won't buy this brand again. "Quite a few don't seem to fire (at least one out of 8), but I am glad that you have them available." Quite a few don't seem to fire (at least one out of 8), but I am glad that you have them available. I was told by a local store that blanks were not available. I get multiple cylinder firing from one trigger pull. A lot of them do not fire. Walther Crimps are among the smallest and the quietest of the .22 blanks that we sell and use smokeless powder. This crimped blank is sometimes referred to as an "acorn" blank because they look like small acorns. 100 per can.